This is a crucial issue, particularly as people become more sensitive to the implications of apps sucking up their personal data and sending it who-knows-where. And with Android(s goog) having introduced toggles that let users kill specific elements of an app’s functionality, the tide is turning — developers have to be more on-the-level with their customers these days. AppPrivacy comes out of an MEF working group dedicated to, well, app privacy. The group includes a bunch of lawyers and representatives from companies such as Mozilla, Vodafone(s vod), mobile ad network InMobi, privacy management firm TRUSTe and security outfit Kaspersky Labs. What’s cool about the tool is the way it gently harangues the developer as they’re filling out the forms. Playing devil’s advocate, I decided to make my “HappyFunTimes” app truly obnoxious, and I ticked the box that said I wanted to send marketing messages to my users’ contacts. Did I mention that I love this tool? Sure, it’s not perfect and yeah, an ad firm is part of the working group, but you know what? It’s an excellent start. People do care about this stuff and, as platforms gradually give users more control over their data, developers need to care about it too. AppPrivacy is not hard to use (I managed it) and it bluntly spells out the factors that developers should be taking into account. I really like this tool and should prove invaluable to the app developer community . Especially when you consider most developers write code and are defainatly not legal or policy experts! Id expect 90% of current mobile privacy policies are generated by copy and paste and some minor word changes (company etc ) And while that’s defainatly bad behaviour it’s easy to understand why that practice is prevelant across the web and mobile, not everyone can afford privacy experts or a legal team! So with that said, very well done on highlighting the necessity for better mobile privacy and providing excellent tools that are free and super easy to use! Security is a major issue for App developers. 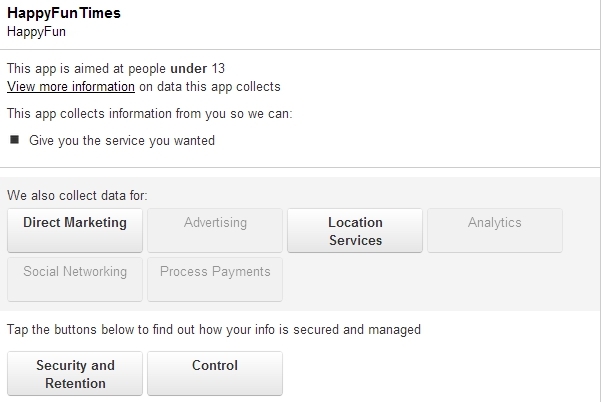 We hope that these privacy settings will help them a lot!